“A lot of different thoughts were running through my head. But the first thing I thought about was my husband, TJ. “I was blown away by that. 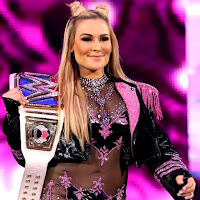 It really reminded me that I’ve worked hard to get to where I am right now and to have a chance at being the women’s champion and to have this opportunity. To tie one of the most iconic women superstars in WWE history, I just have to sometimes step back and look at how far I’ve come and see all that I’ve accomplished and just be so grateful that I’ve had so many incredible opportunities to prove myself.